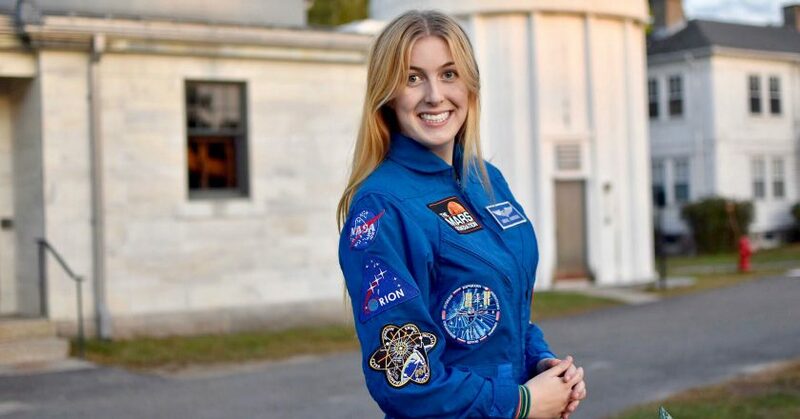 Abigail Harrison—known online as Astronaut Abby—is a 20-year-old aspiring astronaut, college student, influencer and creator of the non-profit, The Mars Generation. The Mars Generation has more than 1,800 students worldwide participating in an innovative Student Space Ambassador Leadership program and has sent over 36 youths to space camp. We spoke with Abby about her inspiring plans to be the first astronaut to walk on Mars, as well as how she is exciting others about pursuing a career in STEM and how she manages to balance college, work and her personal life. College News: How did you know you wanted to be an astronaut? Abigail Harrison: I’ve wanted to be an astronaut for as long as I can remember. Some of my earliest memories are of looking up at the night sky and knowing that I wanted to explore the unknown. CN: Who were your role models growing up? AH: Growing up I looked up to many astronauts—especially the women! Especially prominent to me was Astronaut Dorothy Metcalf-Lindenburger. Not only was she an astronaut, but also an educator. It was her great passion for sharing space exploration that made me look up to her. Three years ago this came full circle when she agreed to join The Mars Generation board of advisors. CN: What’s so special about Mars? AH: Landing humans on Mars is the next stepping stone for humanity in space exploration. It’s just hard enough to make it nearly impossible, but still doable. It will push our boundaries, challenge the very things we believed to be true about our universe, and allow us to make life here on Earth better. It’s also a great opportunity to search for extra-terrestrial life. CN: What does your future look like in regards to reaching Mars? AH: After graduating from Wellesley this upcoming spring with a BS/BA in Biology and Russian Area Studies, I’m planning to go to grad school for a PhD in astrobiology or planetary sciences/geophysics. Following that, I will work for a few years doing scientific research to gain experience and then I will start applying to the NASA astronaut corp. Throughout this time span, I’ll also be pursuing other skills and qualifications which will hopefully aid in becoming an astronaut and eventually getting to Mars. These skills include obtaining my pilots license (this winter break), continuing to obtain advanced certifications in SCUBA diving, studying Russian and Mandarin Chinese, skydiving licenses and anything else that can strengthen by application to the NASA astronaut corps. CN: Can you tell us a bit about your non-profit? AH: The Mars Generation is a 501(c)(3) focusing on educating the public about the importance of space exploration and science literacy, inspiring young people about STEM, and supporting them to pursue careers in STEM fields. We run several core programs including our Future of Space Outreach Program, Student Space Ambassador Leadership Program and our Space Camp Scholarship program that provides full paid (transportation included) scholarships to students experiencing poverty. CN: What inspired you to start The Mars Generation? AH: When I was 15 years old I worked with Italian astronaut Luca Parmitano as his Earth Liaison, sharing his experiences living and working in space with my social media audience. After working with Luca during his six months in space, I realized how important it is to provide inspiration and educational resources for today’s youth. If we want to see humans walk on Mars—to truly become The Mars Generation—we need to be creating a culture today that will result in a highly skilled and passionate work force in the future. Other than space exploration, educational advocacy is my greatest passion in life. CN: Why do you think girls are still underrepresented in STEM occupations? AH: There’s a long standing stereotype that girls aren’t good at STEM—a stereotype which causes bias in the way girls view themselves and their performance and in the way that everyone else see’s and treats them. We often consider this kind of bias to be a thing of the past, but it’s really not. Whether consciously or subconsciously, it still exists and is hugely problematic. CN: How can we combat this? AH: An incredibly important way to combat the underrepresentation of girls in STEM is to showcase women who are already doing great things in STEM fields. By having highly visible female role models we can teach today’s girls to be able to see themselves pursuing STEM fields, and today’s boys to not be surprised when they see girls excelling in STEM careers. It’s especially important that these role models are visible in pop culture and media—where they’ll have the greatest impact. CN: What advice would you give to young girls who are apprehensive about pursuing a career in STEM? AH: I would tell them that it’s okay to mess up! It’s okay to try something and then decide to go a different path! I think that as girls and women we feel that we need to be better—perfect, even—at things we’re told by society that we can’t do. This is exactly the opposite attitude needed for a career in STEM! A huge part of STEM is messing up—it’s failing 99 times and then succeeding on the 100th. That’s because it’s hard, and it’s not something natural—you have to learn it. It can be really easy to be discouraged early from STEM after failing a few times if you don’t realize how normal and vital to the learning process this is. CN: How do you balance college, work and life obligations? AH: It’s hard. Balancing my personal life, my work with The Mars Generation, college, and everything else is a constant struggle. I’m constantly double tasking and trying to squeeze every last second out of my days. For example, when traveling to speak at conferences or represent The Mars Generation as an influencer at events, I frequently find myself doing homework in cars, trains, buses, airports, planes—really wherever I can. Sometimes this means getting creative with how I study or what materials I have available. Even so, there are plenty of times where I really have to ask myself: “What’s important to me? What do I want to put my time and energy into?” And that means sometimes having to sacrifice something in order to do something else well. CN: What would be your number one piece of advice for anyone starting out at college? CN: What is it really like to be an influencer? AH: Honestly it oscillates between being incredibly tiring and out of this world rewarding. Being able to share my journey towards the red planet with millions of people here on Earth has been an incredible honor.